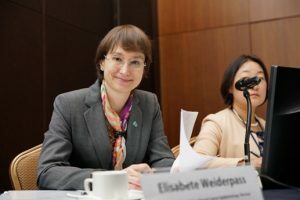 The International Agency for Research on Cancer (IARC) Governing Council elected Dr. Elisabete Weiderpass as the new Director of the Agency. Dr. Weiderpass will take office on 1 January 2019. IARC. Elisabete Weiderpass, MD, MSc, PhD, is an expert in cancer epidemiology and cancer prevention. She currently serves as the leader of the Department of Research at the Cancer Registry of Norway, and of the Genetic Epidemiology Group at the Folkhälsan Research Center in Finland. She holds Adjunct Professorship positions in Cancer Epidemiology in Brazil, China, and the Islamic Republic of Iran, and is a Visiting Professor in Kuwait. Prof. Elisabete Weiderpass participated at the APOCP’s 9th general assembly in Jeju, Korea and she is a good friend of APOCP community. APOCP congratulate her new appointment and wish her many achievements in her new position.